What does your workbench look like? 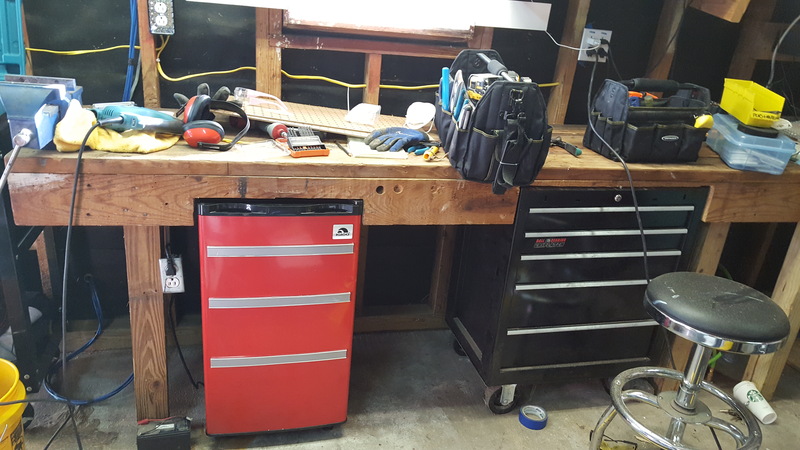 My own workbenches are just wildly embarrassing. I need to tidy. No, I need to excavate. I have a 50G as part of having been an EE major. The professors wouldn't support the TI hardware. And, since I'd done assembly coding of an 8087 math co-processor, RPN made perfect sense to me right away... I also got the 50 and not the 49 because the 49 was complete garbage, quality wise. Yeah, I have HP Prime on my phone, the 50G is now the workbench calculator. This is mine, not to proud but for now it does the job. 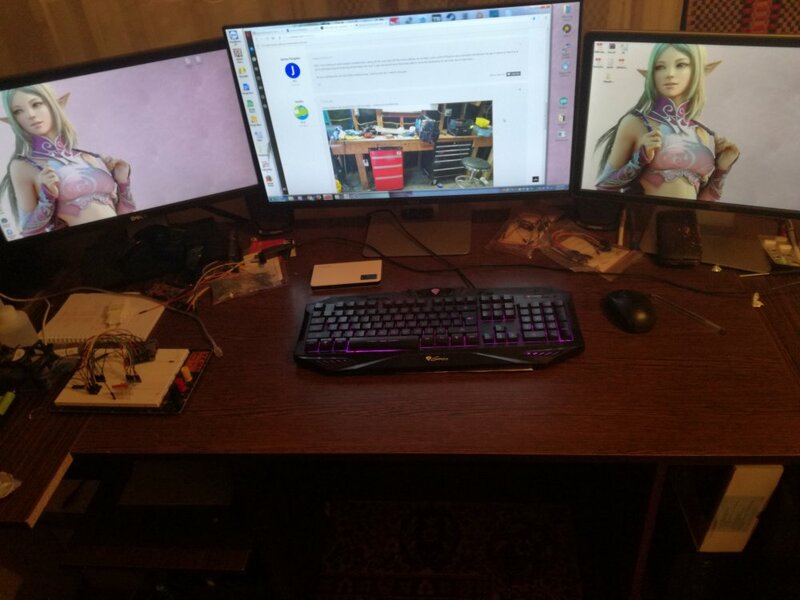 Well, I have 3 mismatched monitors on my PC desk and a pile of crap, so not a bad showing. ;-) My "Mechanical" bench has the drill press and space for the band saw/etc, it's a straight up catastrophe right now. My only confort is that they are all the same resolution and same maker. Overall looks like Frankenstein. My default workstation. Soon it will be deserted on those small notebooks for summer time. 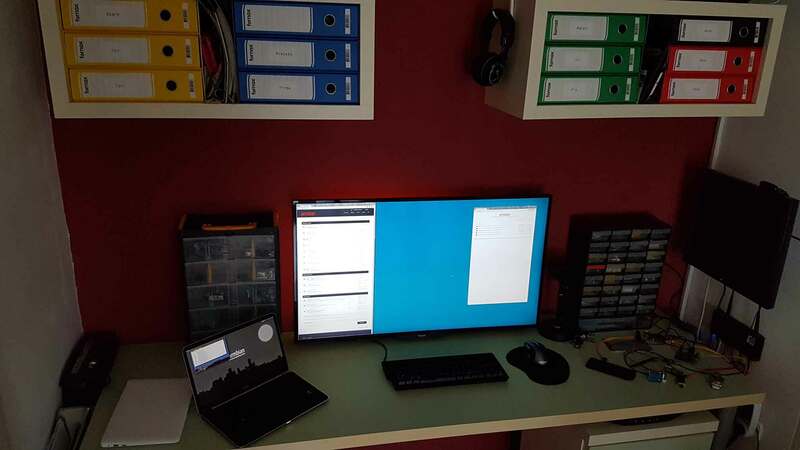 Usually there is, little but not much, random clutter around: papers, cables and boards. Core testing and debugging infrastructure is on the right side. Under the table I have two fix mounted and easy accessible USB powered hubs, which serves as powering and debug. Half ports have secured 1.5A per port. 14 ports in total, connected to server and shared around the network. Powering via extended USB3 hub proved to be enough in most cases, for rest and for special cases I use their original power supplies. which are somewhere below, differentiated with colours. Than there are 15 gigabit and 5 fast Ethernet ports and 2.4G AP. Since I am software developer first and tinkerer second, 40" of property is central point of interest. Sometimes it also get too small and also to avoid more cables, I have another fixed 19" in debug section. On the top of folder shelves I got an extremely low noise build server and another cabinet of electronics stuff. Lower left cabinet is place for small desktop computer and printer, while right side is filled with various parts, from cables, bigger boards, soldering equipment, hard drives, etc. Most of cables are hidden / embedded, to make this mess manageable. When I don't play with boards, I move cabinets in upper level and make use of whole table (minus keyboard and mouse). This explains why I'm posting again.. I finally have a work area! 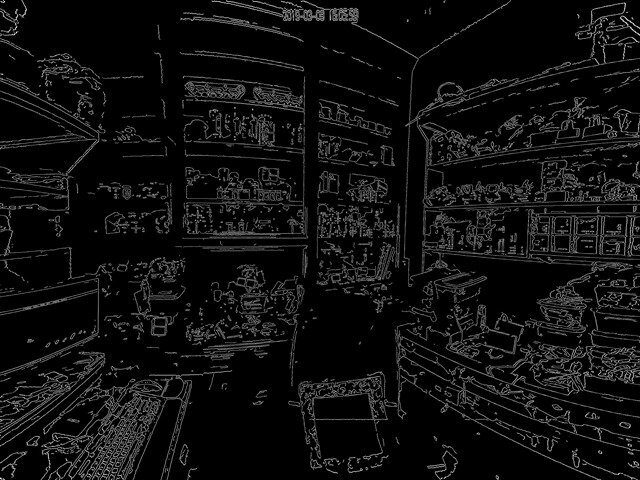 your work area is encrypted! 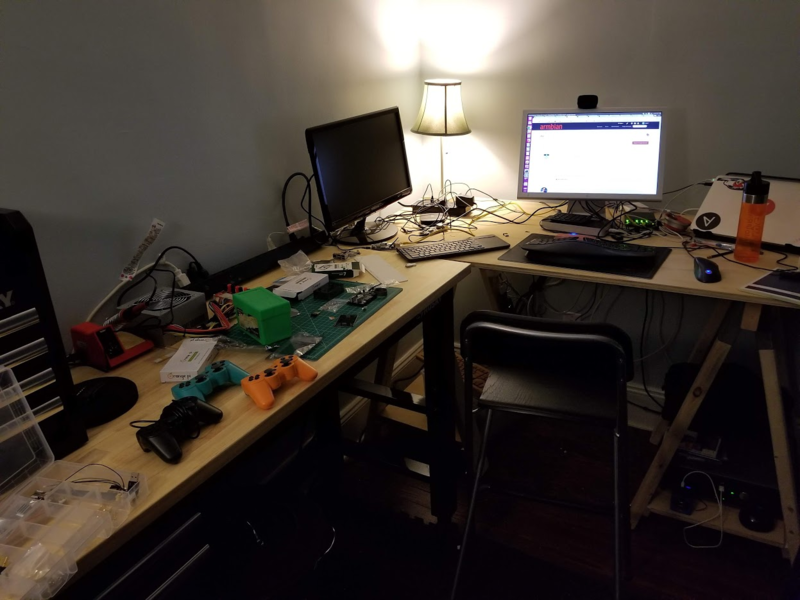 People complain aboutmy kitchen/electronics & solder space. I say you've got to put it where there's room. What's ironic here is that it took an SBC board with only a shell for me to get the hang of RPN. I *dig* it now. I think I'm strange, but I try to *force* myself to use the unix BC or DC desk calculators. Since I could never get the hang of rpn while in school, or with a friend's bitchin hp calculator, I finally tried DC and whaddya know! I like rpn now - it makes sense. Stranger still is just grooving on what was provided back in '69/70 basically by Bob Morris and Lorinda Cherry. Whaddy'a know - it still works nice. Practice makes perfect, and my finger-memory skills using bc or dc is getting better and better. Sorry - had to get that out there. Had to show some cow-orkers tending a redhat box who were all crying about not having a calculator around anywhere. Showed 'em bc. They thought I was some sort of unix super genius. I laughed but kept quiet.